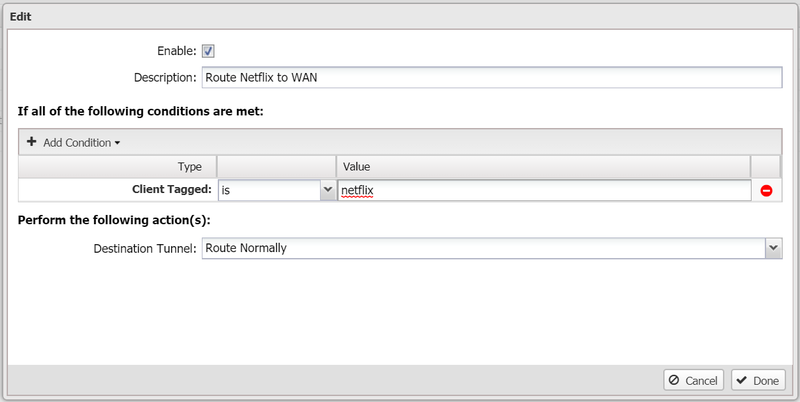 I want to setup ExpressVPN on TunnelVPN so I am permanently going through a VPN, but I want Amazon Video and Netflix to bypass the tunnel. I have been adding the IP addresses from the Web report to the rules, but what condition do I add the URLs? At the moment I am adding them to Server Tagged. I have tried looking through the Web reports for the IP addresses but this doesn't work. Obviously these would change depending on many factors. 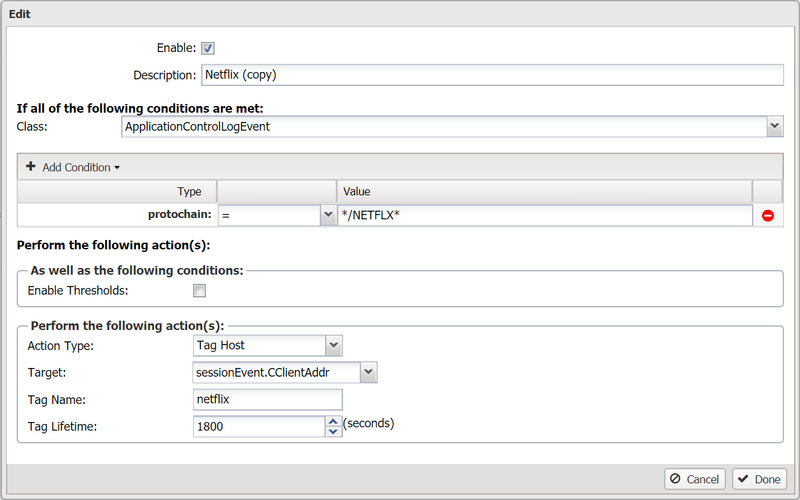 I have tried adding Netflix-user as a client tag but to no avail. Any hep would be appreciated. I can see the sessions tagged with "netflix" in the Sessions tab, but I still get the Netflix warning about VPN not allowed for streaming. I am not sure if all traffic from the tagged PC is now being tagged or just the netflix session. This is very confusing and the documentation is lacking regarding the different "classes". I've tried a few different ones for the event trigger including the ApplicationControlLogEvent, HttpRequestEvent, and SessionEvent, but I'm not sure which one to use. Would you need to include this one too? Any update on this? I copied your event trigger but not working, would also like to understand where you got this event trigger info so I can understand how it works and do some further testing.